I cup of boiled Brussel sprouts contains 60 calories and zero fat. They also contain vitamin A, C, E and K as well as minerals like manganese and copper. Omega 3 fatty acids are also obtained from Brussel sprouts. The antioxidants in Brussel sprouts help prevent premature aging. The fiber in Brussel sprouts helps prevent constipation and lower cholesterol. 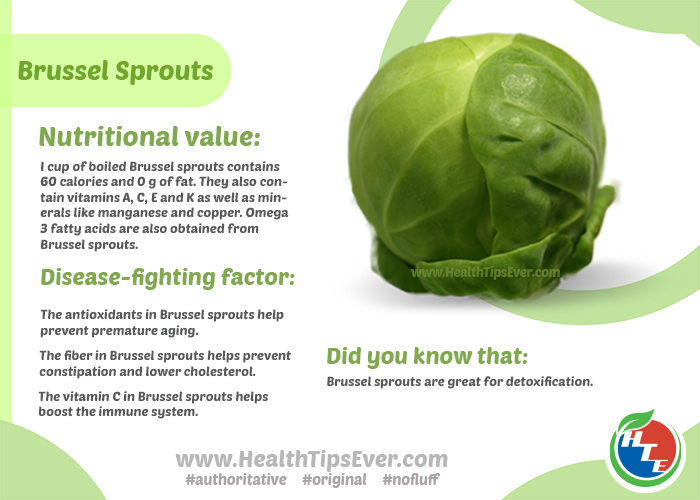 The vitamin C in Brussel sprouts helps boost the immune system. Brussel sprouts are great for detoxification.